Can the daddy be in the cage? OK he's freaking out i don't have a spare cage so i used a laundry basket flipped over he looks fine but i don't know? Also i just realized my bunny's pregnant! So i have no idea what to do they weren't meant to be breeded i was told they were both girls, turns out not :( And i don't have money to buy hay so is there anything else i can do ? I HAVE NO IDEA WHEN SHES DUE ?? You've got two rabbits, one of 'em pregnant. You need a second cage. The daddy can be in the doe's cage for about another week, and then should be removed. You'll have bunnies soon. In a few weeks, you'll need a third cage, unless you can sell them or give them away by the time they're about 8 weeks old. If you have no idea when the due date is, then ensure that the doe has a nesting space in her cage starting now. The question is - how are you going to take care of these needs? Easy: Make some money. Baby-sit. Run errands for shut-ins. Ask your folks if you can do extra chores for extra money. Are you strong? Then shovel people's snow. In a few weeks or a month, they'll be needing lawns mowed. 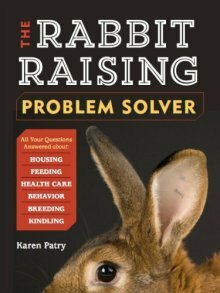 Get creative and find an honest way to make enough money so you can take good care of your rabbits. You'll feel so good about yourself and about life in general! Comments for Can the daddy be in the cage? OH HECK NO ! You are lucky IF she's bred, that she's not fighting the buck for even looking her way. My one doe will fuss even if the buck next to her cage turns in her direction. She stomps and growls at him until he turns away. That's how I can tell she was bred. SO don't ASSUME she is pregnant though chances are very good she is. I had a brother and sister living together in a cage for months (I got them like that) and I put in a nestbox in case the doe kindled and she never did.